In the midst of the musical revolution of 1968, a 24-year old kid named Warren Adams put together an eight-piece band by the name of Purple Image. 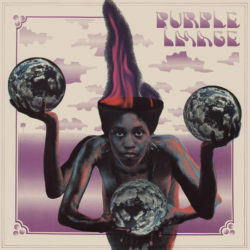 When most African-American bands in the Cleveland, Ohio area turned to R&B and soul music, Purple Image played mind-bending psychedelic funk rock. The band blasted out a thumping psychedelic sound much like the post-Hendrix black rock of their Detroit counterparts ‘Death’ and ‘Black Merda’. As the band grew in popularity, a first single was recorded and “Marching to a Different Drummer” was released on Map City records. With the help of a popular Cleveland DJ the song became a number one hit and paved the way for public performances at the Cleveland auditorium, where they opened for acts from the likes of Steppenwolf and Aretha Franklin. Wasting no time, the band started the recording of their first (and only) album, the self-titled LP ‘Purple Image’. This obscure album recorded on Map Records in 1970 has since then risen to the status of cult because of its scarcity and the musical orientation. An energetic, powerful blend of acid rock and fusion, frantic Coltrane-ish sax, a blistering amalgam of rock, soul and funk … it sounds best when the volume is cranked! The album at its heaviest moments is as heavy as The Stooges on Fun House…it’s hard, mean and direct, and still ultimately groove-based. The band’s unique psychedelic sound is an attestation to the times in which they were immersed, and a reflection of their own reality. This album is an outstanding example of psychedelic rock and funk fusion that shouldn’t be missed. Together with their (few) contemporaries the band lay the foundations for future African-American crossover acts such as Fishbone, Bad Brains & Living Colour. Tidal Waves Music now proudly presents the official vinyl reissue of this RARE(original copies tend to go for large amounts on the secondary market) super-heavy 1970 psych-funk album. Now finally back available as a limited vinyl edition (500 copies) complete with the original artwork and exclusive liner notes/pictures provided by Purple Image’s founding member Warren Adams and family.